JNN 10 July 2014 ISLAMABAD — Pakistan’s third plutonium-producing reactor is in service at its Khushab nuclear site, according to the International Panel on Fissile Materials (IPFM), and is likely to have already produced fuel. The IPFM is “an independent group of arms-control and nonproliferation experts from both nuclear weapon and non-nuclear weapon states” and highlighted the latest developments in Pakistan’s plutonium program in a June 30 IPFM blog entry. 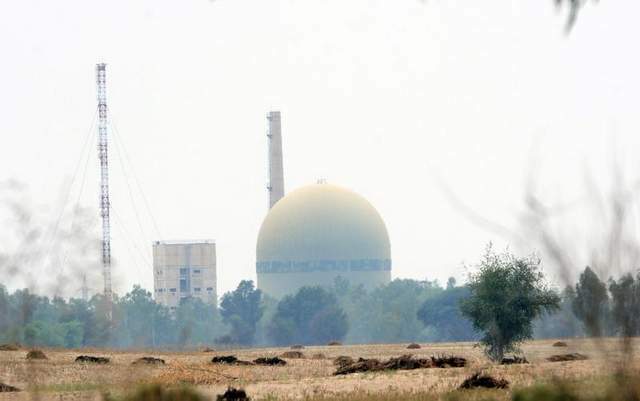 Using commercial satellite imagery from March 2013 and December 2013, it says the Khushab III reactor now appears operational due to water vapor rising from its cooling towers, but the Khushab IV reactor is still under construction. It bases its assessments on the three operating reactors having a power of 40-50 megawatts, in which case, operating at 50 percent capacity, they could each produce 5.7 to 7.1 kilograms of weapon grade plutonium per year. At 80 percent capacity they could each produce 9 to 11.5 kilograms of plutonium. Based on these calculations, IPFM estimates Pakistan has accumulated about 170 kilograms of plutonium from the Khushab I and Khushab II reactors. It claims this would suffice for approximately 35-40 warheads of 4 to 5 kilograms of plutonium per warhead. Analyst Shashank Joshi of the Royal United Services Institute says he is wary of analyzing the figures of production capabilities based on satellite images. Mansoor Ahmed from Quaid-e-Azam University’s Department of Defence and Strategic Studies, who specializes in Pakistan’s national deterrent and delivery programs, says this fits into a long pattern of reporting that shows Pakistan has a fast-growing ****nal but one he believes still pales in comparison to India’s. He highlights a number of reports, including from the IPFM itself, that show India “is expanding and adding several un-safeguarded facilities in its military nuclear fuel cycle suitable for producing fissile material,” and has the world’s fastest growing nuclear program. “These include the rare materials plant centrifuge facility; a second plutonium production reactor; and one 500 megawatt electricity experimental fast breeder reactor. In addition, four reprocessing plants of 350 thm/year [tons of heavy metal per year] are in operation, an industrial-scale 500 thm/year reprocessing plant and another large industrial scale centrifuge enrichment plant are in the pipeline along with four additional” fast breeder reactors by 2020, he said. He says the significance of these cannot be underestimated. “These stocks are outside [International Atomic Energy Agency] safeguards and are sufficient for producing about 250 warheads from weapon-grade plutonium; 40 warheads from HEU; and 1,875 warheads from reactor-grade plutonium, which was used in one of India’s 1998 nuclear tests” he said. Additional capabilities will be added within the next three to five years, he said, that could produce another 171 kilograms of weapon-grade plutonium. “These figures would add up with existing capacities and would allow India to produce about 100 warheads from weapon-grade plutonium and HEU each year in addition to 50 warheads from one PHWR run on low-burn up,” he said. “Even if a fraction of the other seven PHWRs are used to produce fuel for India’s fast breeder reactors as claimed, these can still add another 137 weapons worth of fissile material each year,” he said. Still, analyst and former air commodore Kaiser Tufail believes Pakistan is reasonably secure. “Pakistan’s nuclear triad exploits certain peculiar advantages of each delivery system,” he said. He also said that the aircraft delivery method has a flexibility beyond that of other systems. “Air-launched bombs/missiles allow a last ditch ultimatum, as the aircraft can be recalled if the adversary backs down,” he said. Ultimately, the issue becomes a balance of delivery systems rather than warhead type. Joshi is generally of the same opinion, and says that it is unclear how many small/tactical warheads Pakistan needs. This entry was posted in Asia Pacific, Pakistan News and tagged Khushab, Khushab Reactor, pakistan, Pakistan 3rd Nuclear Reactor, Pakistan Nuclear facility. Bookmark the permalink.